It’s the penultimate edition of the Friday Hall of Famers for October and the honoree this time around is a multiversal character who for me is the ultimate symbol of Toobworld horror. Barnabas Collins is a fictional character, a featured role in the ABC daytime serial ‘Dark Shadows’, which aired from 1966 to 1971. Barnabas is a 175-year-old vampire in search of fresh blood and his lost love, Josette. 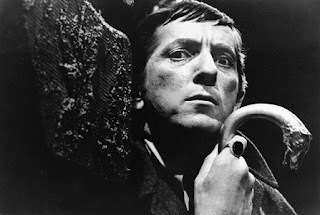 The character, originally played by Canadian actor Jonathan Frid, was introduced in an attempt to resurrect the show's flagging ratings, and was originally to have only a brief 13-week run. He was retained due to his popularity and the program's quick spike in ratings, and became virtually the star of the show. A defining feature of Barnabas' character development is his gradual but persistent transformation from a frightening creature of the night into the show's protagonist, who selflessly, heroically and repeatedly risks his life to save the Collins family from catastrophe. Barnabas Collins was a member of the late 18th century Collins family, from the fictional town of Collinsport, Maine. He was the son of Joshua Collins and Naomi Collins. Barnabas' many cousins included Millicent and Daniel Collins. During the flashback, Barnabas intended to marry an heiress from Martinique named Josette du Pres, but had a brief affair with Angelique Bouchard, Josette's maidservant. Upon Angelique's arrival in Collinsport for the wedding, Barnabas was determined not to resume his affair. The spurned Angelique Bouchard, a practitioner of witchcraft, used a number of spells to manipulate Barnabas and his family and force his agreement to marry her. Barnabas discovered Angelique's duplicity, and shot her. With what she believed to be her dying words, she took revenge on Barnabas by summoning a vampire bat from hell to attack him. Barnabas fell extremely ill and died. Angelique survived and attempted to rescind the curse, but was unsuccessful. Barnabas shortly thereafter rose as a vampire, and soon strangled Angelique. Collins later frightened his aunt Abigail to death, and left the hatefully fanatic witch-hunter Reverend Trask entombed alive in the Old House basement. Sarah Collins died of pneumonia after a cold night spent hiding in the woods from her deceased brother. Adding to Barnabas' grief, his mother Naomi committed suicide after discovering his secret. Barnabas Collins blamed Angelique for the deaths of both his sister and his mother, and also blamed Lt. Nathan Forbes, who had told Naomi about him. Barnabas strangled Forbes, and attempted to transform Josette into a vampire. Josette was willing, if not fully cognizant of what this would entail, until Angelique revealed a vision of what she would become. Fleeing from Barnabas, Josette leapt off the cliffs of Widow's Hill to her death. Unable to bear what he had become, Barnabas Collins asked his father, Joshua, to destroy him. Joshua Collins was unable to slay his son, and ordered servant Ben Stokes to nail a cross to the inside lid of Barnabas' coffin and to wrap chains on its outside, forever imprisoning the vampire in a secret room of the family mausoleum at Eagle's Hill Cemetery. In 1967, while searching the Collins family crypt for their rumored lost jewels, Willie Loomis stumbled upon the chained coffin in which Barnabas slept. Believing the coffin to contain the Collins family riches, Willie inadvertently released the vampire. Barnabas attacked Willie and turned him into his unwilling servant. Barnabas Collins introduced himself to the modern Collins family as a cousin from England, a hard-working businessman never seen during the day. The family accepted this story, despite having never before heard of him, because of his resemblance to the portrait of the ancestral Barnabas which hung in Collinwood. The thirsty Barnabas made victims of several Collinsport residents. He was particularly taken with waitress Maggie Evans, who resembled his long-lost love, Josette. Barnabas was told by David Collins that Josette's spirit still haunted the Collinwood estate, where it periodically helped and protected others, including young David. Barnabas Collins kidnapped Maggie, hypnotized her to believe that she was Josette, and planned to make her his vampire bride. Maggie escaped with help from the ghost of Sarah Collins, but the emotional distress of being kidnapped caused Maggie to regress to a childlike mentality and to forget all that had happened. 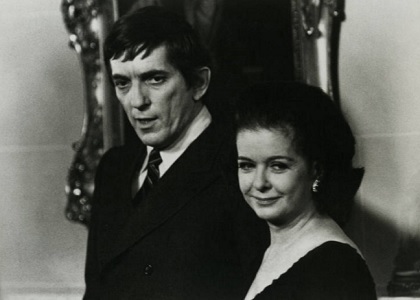 Barnabas Collins then targeted David's governess, Victoria Winters as a potential consort. He tried to seduce her away from her fiancé Burke Devlin, and then to bite her. The ghost of Sarah appeared repeatedly throughout and warned Barnabas, who was tormented by a feeling of responsibility for her death, away from evil deeds. 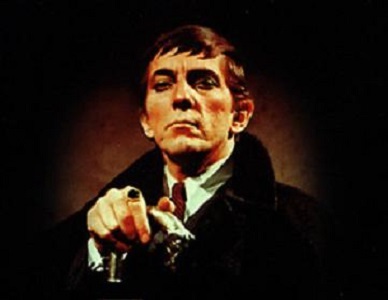 In Earth Prime-Time, Barnabas Collins may only have one show to his credit, even if he did 594 episodes worth. But he was also in the Cineverse and in the Audioverse as well, making him a multiversal. Then there is the possibility he appeared in another TV dimension as well. That one will need some splainin. Here are the credits for Barnabas Collins. All of the summaries are from the IMDb, unless otherwise specified. ‘Dark Shadows’The rich Collins family of Collinsport, Maine is tormented by strange occurrences. Vampire Barnabas Collins is accidentally released from his centuries-long confinement at his family's estate in Maine. He targets his clueless descendants who live there now and pursues Maggie, the incarnation of his lost love. The 1970 MGM film “House of Dark Shadows” centers on the release of Barnabas Collins from his coffin by Willie Loomis. Unlike Frid's television portrayal of Barnabas, the Barnabas featured in the film was truer to a typical evil vampire, who by the end of the film had killed half of the Collins family. 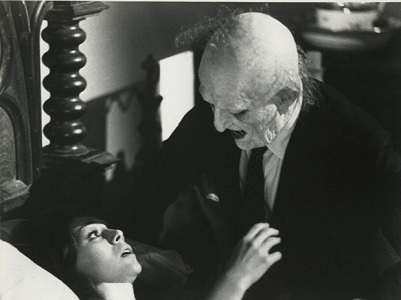 Barnabas himself is killed by Jeff Clark, now depicted as Maggie's boyfriend, and a dying Willie Loomis, when Barnabas tries to make Maggie Evans his vampire bride. 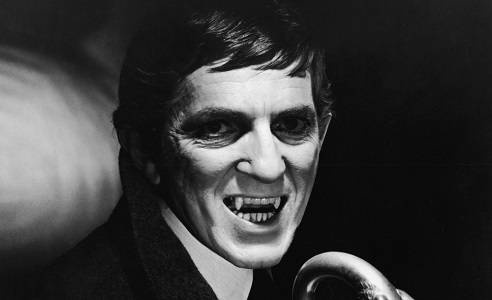 Barnabas does not appear in the sequel, "Night of Dark Shadows", which focuses on another relation, Quentin Collins. O’Bservation: This is not a movie which can be absorbed into the TV Universe, nor even be found in one of the Borderlands, which combine the Cineverse and Toobworld at key points, like a Venn Diagram. Because the storyline was altered even if slightly from what actually happene on TV, then “House Of Dark Shadows” should remain in the Cineverse. Jonathan Frid returned to portray the role of Barnabas Collins one last time, but in a world in which he was heard but not seen..…..
‘The Night Whispers’ is a 2010 Big Finish Productions original dramatic reading based on the long-running American horror soap opera series ‘Dark Shadows’. As a storm rages through Collinsport, a mysterious spirit threatens Barnabas Collins. And then there is the universe where Barnabas exists and can be assumed to be the same as the televersion due to Jonathan Frid’s depiction on the covers. A team of three teenagers faces off against a team of three adults. Contestants must answer questions to earn points. The catch is, the teenagers must answer questions from the adults' time period, and the adults must answer questions from the youth culture. Which team will know the other generation better? O’Bservation: Frid showed up in the next episode as himself. 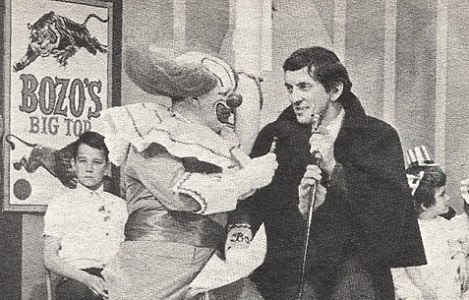 Frid also appeared on the ‘Bozo The Clown Show’ of WJRT and in some local version of 'Dialing For Dollars', dressed as Barnabas Collins. 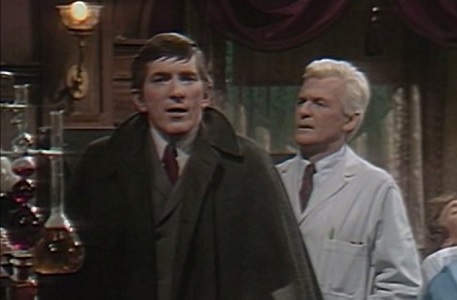 Within the universe of Earth Prime-Time, ‘Dark Shadows’ was a TV show as well, running during the same time period as it did here in Earth Prime. This is buttressed by its mention in two episodes of ‘Mad Men’. Its existence as a TV show within the TV Universe was also confirmed by ‘Angel’, ‘Gilmore Girls’, and ‘King of Queens’. This was produced by the agents of UNReel. 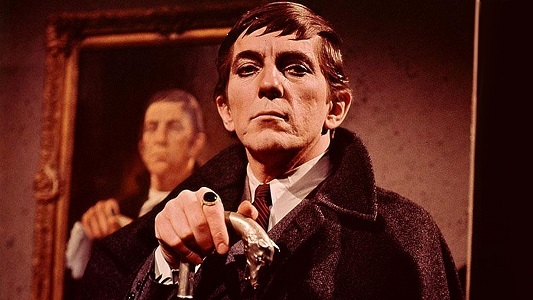 They hired the televersion of Canadian actor Jonathan Frid to play the role of the vampire Barnabas Collins in both that TV series and the movie of “House Of Dark Shadows”. This would provide plausible deniability – much like “weather balloons” when it came to UFOs – when people vacationing in Maine claimed they saw the real Barnabas Collins in action – if they survived the encounter. If they knew about Barnabas, why would agents of a shadow ops group (associated with UNIT) want to protect the vampire rather than go to Collinsport, hunt him down, and destroy him? This is fanfic territory, but I imagine Barnabas Collins served a purpose that the government decided was more important than those lives lost to his bloodlust. He may have served in a “Suicide Squad”/”League of Extraoridnary Gentlemen” type of group on top secret missions to save Earth Prime-Time. That's my Occam's Razor splainin. It's certainly simpler than the premise of two supernatural beings meeting in plain sight. One a vampire, the other the embodiment of evil taking the form of a clown to lure children to their deaths. I'm not saying it's Pennywise or even one of the Killer Clowns from Outer Space. But in the reality of Toobworld, it's pozz'ble, just pozz'ble, that at least one of the many incarnations of Bozo wasn't actually a human. I've got plenty of coulrophobic friends who would readily believe that! 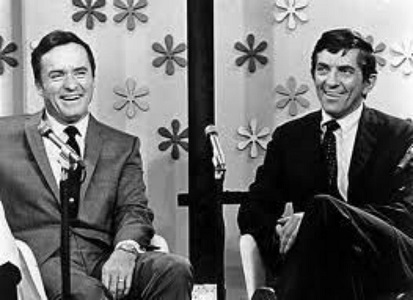 During his heyday as Barnabas Collins on ABC-TV's Dark Shadows, Jonathan Frid made guest appearances on different shows, including the Mike Douglas Show. However, Frid was also called upon to make an appearance on Bozo the Clown's show at the WJRT TV station and also . 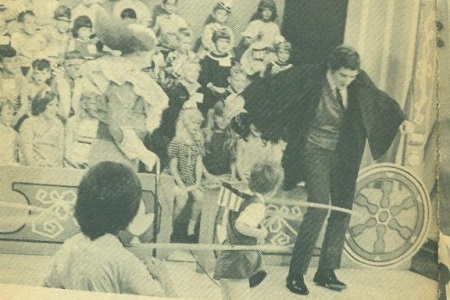 Here's a photo of Frid as vampire Barnabas Collins trying out a Hula Hoop on the Bozo show as Bozo watches while holding Barnabas's cane. 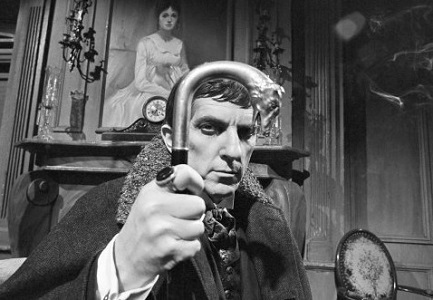 So the televersion of Jonathan Frid was probably an unwitting pawn in the plan to keep the rest of Toobworld believing that Barnabas Collins was fictional, a practice that probably began with Dr. Watson’s stories about Sherlock Holmes. At any rate, his appearance on those three shows as Barnabas Collins are not officially of the vampire, but they do acknowledge that Barnabas existed. 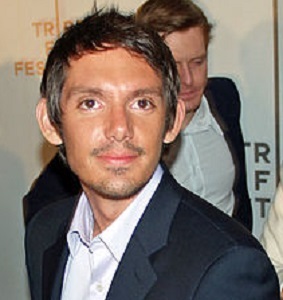 But if such a remake as I suggested happened, I have a recastaway wish-craft for Barnabas: Lukas Haas. But there could have been appearances in ‘The X-Files’, ‘Supernatural’, ‘Kolchak: The Night Stalker’, even cameo appearances in shows that are out of left field. Let’s say he took a trip to the Big Apple: ‘McCloud’, ‘Kojak’, ‘Law & Order’, even as a cab passenger in ‘Taxi’. 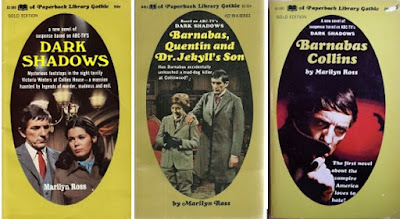 If it was just Barnabas who was brought back in some TV remake, I could probably come up with a reasonable splainin for why his physical appearance had been altered. But more than likely the same situation as happened with the 1991 remake, almost every character from the original was recast. So that show had to be relegated to Toobworld2 and we’ll never see that Barnabas in the Hall of Fame. So as a representative of the Multiverse, we welcome Barnabas Collins to the Television Crossover Hall of Fame. I'm dedicating today's blog post entry to my fellow Iddiot, Tay Mueller. She's quite a dedicated fan of 'Dark Shadows'.